The Idaho Batholith is a gigantic granite intrusion covering thousands of square miles in the center of the state, formed at a time when dinosaurs still roamed the lowlands of nearby Montana at will. In spite of the age of its constituent rocks, it is rough, raw, with sharp peaks and steep valleys, cut by the Salmon River—locally known as the “River of No Return.” No major thoroughfares transect the wilderness; there are no major cities or towns located in its rugged landscapes. Few people are even familiar with how utterly empty the region is. I’ve driven some of the highways on its periphery and have been mightily impressed with the loneliness the area, the sense of nature overwhelming petty human efforts to encroach on its isolation. Everything about the region speaks of remoteness, solitude, reclusiveness. Even its earliest American explorers, Lewis and Clark, found it impossible to travel on its wild waters…hence its local name. It is almost as if something—something unknown and unknowable—has restrained incursions into the emptiness. As if…. Joanne Pence’s highly enjoyable paranormal novel looks into that as if and narrates a story of occult secrets centuries old and mortally dangerous to explore, all focusing on the granite wildness of central Idaho. Her characters range from a middle-aged university professor guiding archeology students on a field trip; to Indiana Jones-style action-adventure types; to hard-muscled, well-armed mercenaries packing the most sophisticated firepower; to old-West style lawmen; to psychically wounded men and women confronting the coldest of all mysteries—Death itself. Her landscapes include not only the Idaho wilderness but places both exotic and familiar: the deserts of Mongolia, the crowded streets of Jerusalem, the stuffy museums of Paris, the inextricable complexities—both physical and psychological—of Washington, D.C., and the rarified reaches of “Big Pharm” in New York. With each change in locale, Pense brings sufficient details to create believable situations, although she is at her best in limning the virtually untouched world of the great Batholith. Her plot is both convoluted and direct. It hinges on a single “what if”: What if, centuries ago, an alchemical adept had secreted in the heart of Idaho a long-forgotten book, a treatise dating back to the beginnings of the Christian era, that contained the key to transmutation—to the ancient study devoted not simply to creating gold from base metals but also to transforming frail, time-bound man into an immortal…a god? As odd as this might sound—central Idaho?—Pense crosses her Ts and dots her Is in constructing a web of events that make it plausible. Does she depend on coincidence in bringing together her wide cast of subjects? Yes, but ultimately, in the world of Ancient Echoes, there are no coincidences; there are only the manipulations and machinations by proto-chemists who unraveled the greatest mystery of all and must now live with the blessing—and the curse—of immortality. Along the way from outer Mongolia to central Idaho, readers will confront the unanticipated, the unbelievable: a centuries-old corpse, flawlessly preserved, that triggers the final round of events; two perfect columns of living granite, topped with, of all things, Egyptian hieroglyphs, that might or might not be portals to another world; and—perhaps most fascinating of all—creatures unknown to science, unidentifiable, horrific, and deadly. 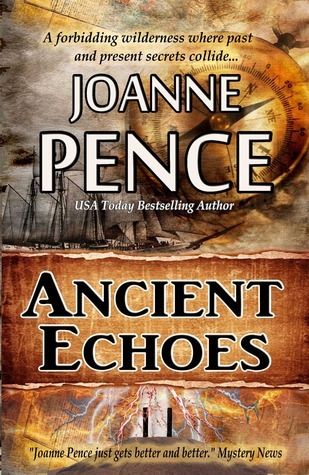 An intriguing blend of history, action-adventure, religious speculation, alchemy (theoretical, philosophical, and practical), and horror, with occasional touches of psychological thriller and romance, Ancient Echoes is a well-crafted tale designed to entertain and perhaps even enlighten.